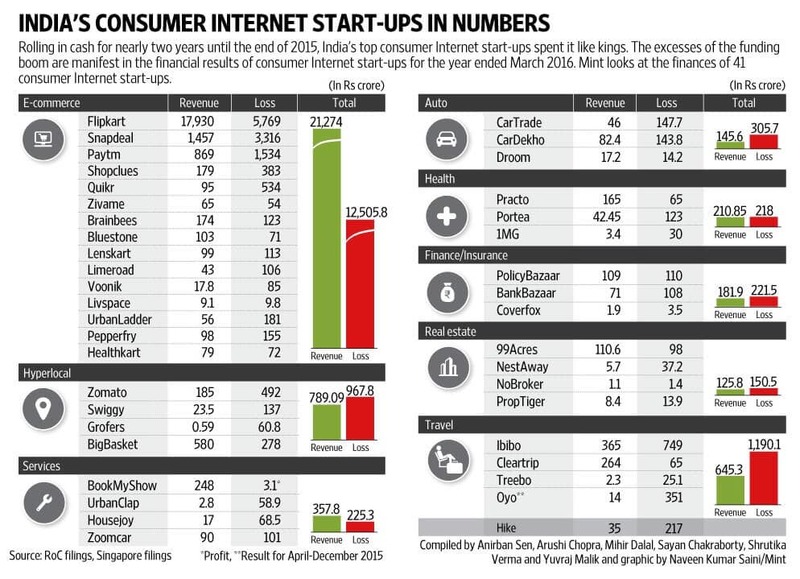 What's wrong with Indian (funded) startups? Noticed something important? The loss column has eye popping figures. Flipkart's got losses north of Rs. 5500 Cr. Almost every e-commerce company is deeply into losses with no sign of breaking even. The Hyperlocal segment is even worse - the revenues are lesser than losses! Zomato, which is quite successful in what it's doing has had losses of Rs. 492 cr against revenues of Rs. 185 cr. Other sections aren't good either. But look at one exceptional company out there! It's 'BookMyShow'! The company actually made a profit of Rs. 3.1 Cr against revenues of 248 Cr. Now that's what I'd want to call a 'real business'. Others, just some money thrown by VCs. Do you think the other companies have any chance to survive? How long will the funds keep flowing in?